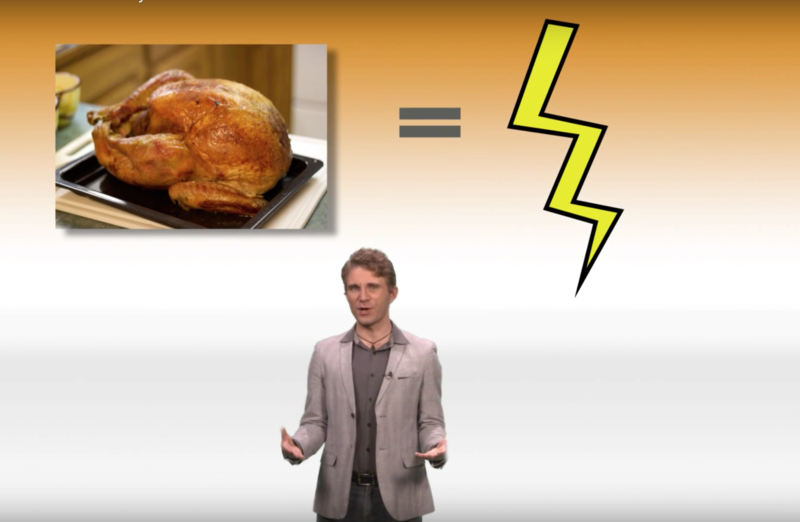 Despite the fact our turkey dinner konks us out, we all understand food is energy for our bodies, and that energy is actually the same energy that runs our cars, that heats our homes and that charges our phones. See, almost all of the energy on our planet is solar, or really, it’s nuclear. That sun energy beams down to the earth’s surface where it’s happily lapped up by plants, which can convert that energy. That’s something we animals cannot do, but we can eat the plants and steal their energy or eat the other animals that ate the plants and get it that way. It’s all the same energy, just moving around. This has been going on for hundreds of millions of years, back then, a lot of those plants, and some of the animals were covered up by sand and mud and rocks, and their sun energy was trapped before anybody else could get to it. Eons pass and those plants and animals changed into coal, oil and natural gas, which we discovered we can set on fire, and get that stored sun energy back.